Celebrate Halloween 2019 in Alaska. The state is known for its beautiful wilderness and long winters. It is not known for zombies, demons, devils, creatures, freaks and other spirits known to frequent haunted houses. So we were shocked to learn that a few ghosts decline to migrate south for the winter and continue to scare thrill seekers in haunted houses in Alaska around Halloween. 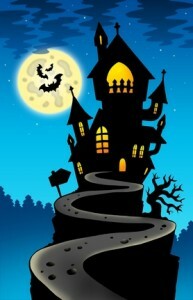 We’ve located a few haunted houses to enjoy in Anchorage, Fairbanks and Juneau. We have separate attraction links and listings for haunted houses USA, haunted corn mazes, haunted trails, haunted zombie paintball, haunted forests, haunted hayrides, and ghost tours. This popular attraction is closed for 2016. Nugget Mall hosts a number of Halloween events in October. I have been to the Gateway to Darkness, 1241 W. Melanie Ave., Unit 4, Wasilla, AK 99654 about 5 years ago. Although it is expensive ($15), if you love scary haunted houses, the price is worth it. I am a wimp myself and will not go back because I was scared out of my mind. At one point, I stuffed my face into my husband’s back and closed my eyes. All I could hear behind me was someone whispering in my ear “Wanna play a game?” My husband loves scary movies and admitted to me later that he was afraid but was trying to put a brave front on for me so I wouldn’t freak out. Even the beginning of the house was frightening because you had to walk thru a tunnel of plastic that was being pushed at you by forced air so you were literally squeezing yourself thru and couldn’t see even a foot in front of you. Whoever thinks of this and puts it together puts a lot of time and effort into the planning. It is not for the faint of heart or small children. PS. My husband has gone back several times without me since our visit. Where I come from, slc, UT, haunted houses are a MAJOR deal the entire month of October. “Gateway to Darkness” in Wasilla. Which apparently was closed for 2016. However, this site says last updated 2017. SO, will the Gateway to Darkness be open for October 2017? If not, is there ANYWHERE to visit a haunted house in Alaska, 2017?